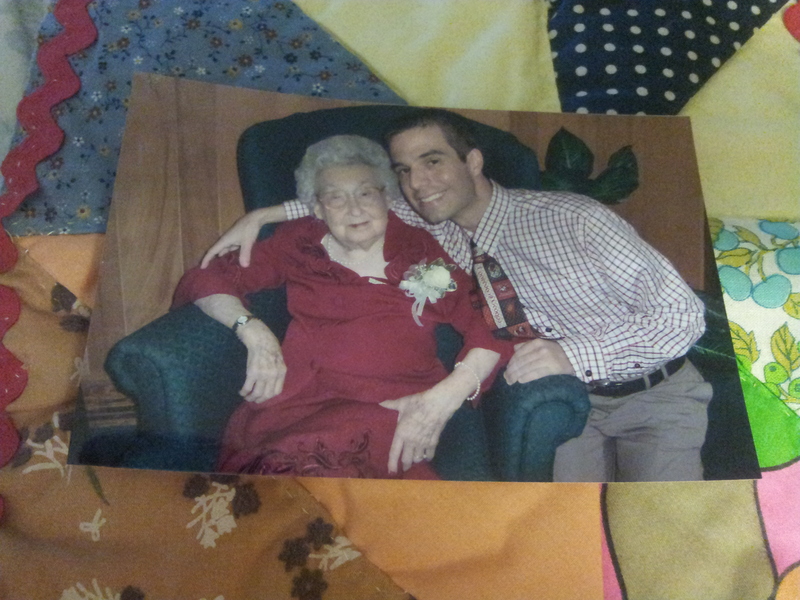 My precious Granny passed away in her sleep last Monday at the age of 98. I flew home for her funeral and did the eulogy, something that had been planned for a few years. In fact, Granny knew what I was going to say about her because I told her one day when we were riding around in my truck when I was home visiting her. Aunt Mildred had asked me if I’d speak at the funeral when the time came, and I wanted to make sure Granny was okay with what I was going to share about her. Granny’s response, in typical fashion, was something along the lines of, “Son, that sounds just fine. And thank you for doing it.” She was a very humble woman; her favourite part of the funeral by far would’ve been all the flowers. 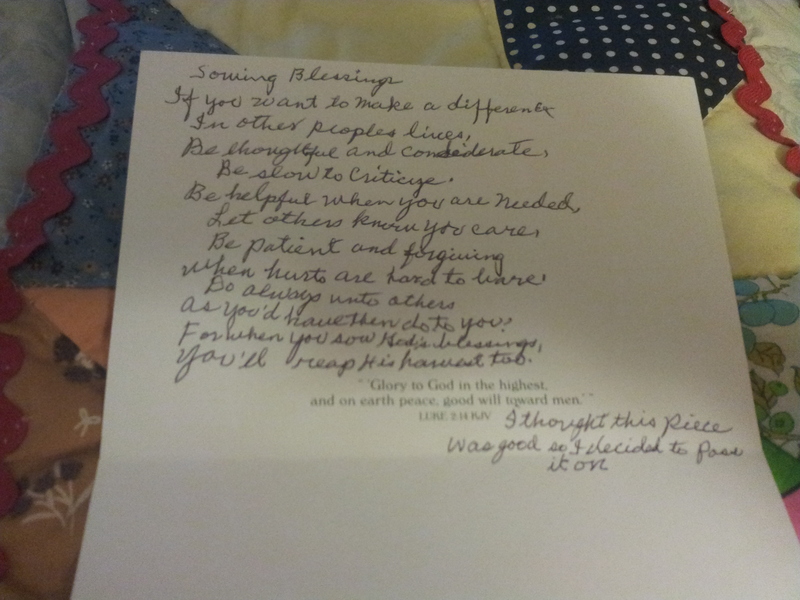 Granny died only a few weeks before her 99th birthday, and since I’d already bought her card, I even read it towards the end of my eulogy since it was so apropos. I’m still a little numb emotionally–perhaps I’m in shock, I’m not sure–but I wanted to blog and share some of the things I shared during the eulogy. The quilt scrap which is serving as the background in most of the pics was used to illustrate her love of quilting, as well as the fact that she was the thread that held our family together the last 32 years. 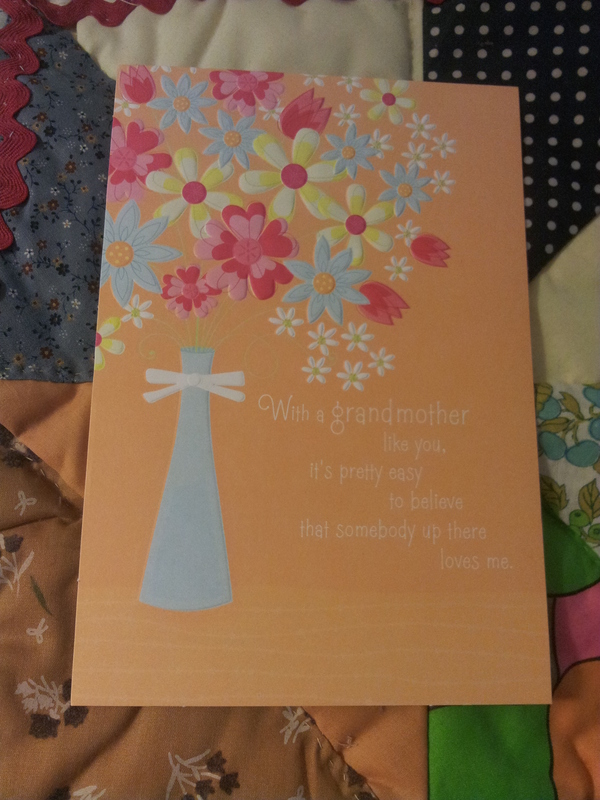 I also shared a couple of other cards, as she was so fond of sending and receiving cards. She also loved poetry–here’s a couple of poems I shared. She wrote this one in a Christmas card. 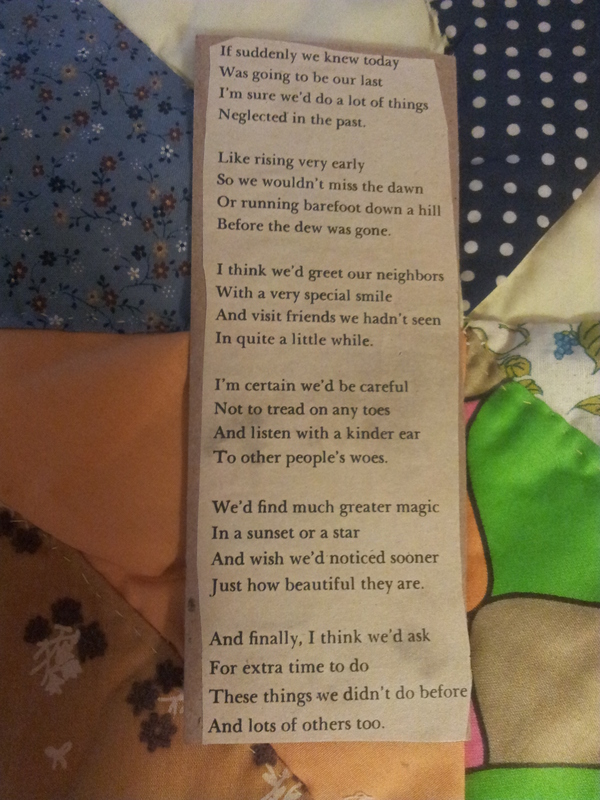 I found this poem when we cleaned up her house several years back. I read it at the very end of the eulogy. The funeral was lovely and it was wonderful to see so many friends, family, and loved ones and to hear so many stories about how Granny had touched so many lives over the years. The wife of the preacher who officiated the service put it best to me at the fellowship following the graveside service: “She preached her own funeral.” And she did, because she lived her life in such a godly way that all who knew her knew she loved the Lord. She’ll be dearly missed, but I know she’s up in heaven rejoicing with my Granddaddy and all her other loved ones who went before her, and I wouldn’t be surprised if she’s planted some flowers up there already, either. In fact, I’m sure she has. I love you, Granny. You are missed so much already. This is a beautiful tribute to a beautiful woman. I can see where you get your passion for writing from. You were blessed to have such a great relationship with your grandmother, Brian. Cherish those memories!